Guest posting today is Jeanne of Bees Knees Bungalow whose made over laundry room had me smiling the minute I laid eyes on it. She added so much whimsy and personality in here, I can't imagine anyone who could look at it and NOT smile. Love. Hello Brooklyn Limestone’s faithful! I’m Jeanne and Bees Knees Bungalow is my blog. Stefanie graciously invited me over to share my much improved laundry room space. I am thrilled to be here an happy to share it with you. 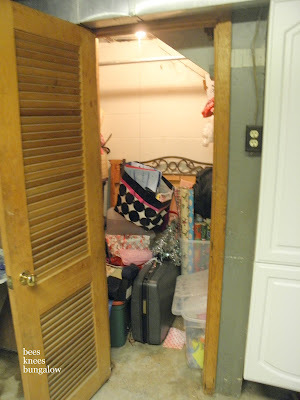 Here is story of how a darling laundry room was born from an old musty closet. These two pictures are of the exact same place, before and after. Our house is 62 years old. The closet in our basement was wet and musty, adding to the overall dingy basement laundry room. It was time for it to be dealt with. That closet clean up became the closet tear out and evolved into the laundry room being ultimately redone and made fabulous. It was work, but it worth it. A wasted, dingy space is now bright and fabulous. Who knew going down to do laundry could be fun? The Cabinet Maker Husband painted the open beam ceiling white. I painted the walls. We stained the floor with cement stain. It has held up REALLY well. We bought the light fixture cords from Ikea. I bought the aqua Ball jars and colanders at flea markets. The dresser was $25 at Goodwill. I painted it red. The color is Ladybug from Behr. I collected the cookie cutter ‘drawer pulls’ and the upper cabinet door handles at flea markets and tag sales. Coco, the dress form was found this summer at an antique show for $40. Score! The doll house was passed down to us. We’ve had it stored for several years and I am happy to use it as a functional and darling shelf. Making detergent and cat food jars easily accessible. The Launderette, I painted on the wall. The room is open, fresh and has less places for those basement spiders to hide! This all began because a closet needed to be organized. I’ll take a red dresser in it’s place any day! Thanks for letting me stop by and play at the Limestone. Now I must go fluff and fold. I have a book I think you will like: Creole Thrift by Angele Parlange (the same Parlange as the iconic southern Plantation.) My favorite is the vintage photograph shower curtain. So many cute and unique additions to this room! I especially love the doll house serving as a shelf since it has a story behind it! And the red dresser- love it! Great work Jeanne! wow-so so so grea! love the space! Love it! I love the dollhouse too. I saw that on Country living or Country Home once - I can't remember which but I wanted to try that as well. It looks great. I love how you used found objects to decorate. It is so charming! This is a unique space and an inspirational laundry room. I love all the details down to the colander ceiling fixture. Lots of creative ideas here. That light fixture is adorbs! The room looks great! Since its open and all, surely will give freedom. is it possible to link the actual post from her blog? (unless it was not posted of course) it's hard to go back to the original blog for these features and try to find everything. thanks so much for the ideas! The very first link in this post links back to her laundry room. Love this! Red and turquoise are a favorite combo of mine. I especially liked the red dresser and the Launderette words painted on the wall. And $40 for a dress form? Score, indeed!